Why wouldn’t you want to be 100% certain about bacterial presence? In the recent publication in the Journal of Wound Care ‘Point-of-care fluorescence imaging predicts the presence of pathogenic bacteria in wounds: a clinical study’1, the authors demonstrated that red fluorescence observed on MolecuLight i:X images of 60 wounds predicted the presence of bacteria 100% of the time. Of course, the question that arises is, why does this matter? Don’t all wounds have bacteria? How will this affect clinical practice? A key finding in this study is that red fluorescence on images corresponded to total bacterial levels of ≥ 104 CFU/g (or the equivalent of moderate/heavy bacterial growth for those using culture based wound sample analysis). This information can be critical to wound care clinicians on many levels. First of all, for those sampling, they can be 100% be confident that when they choose to sample a region of red fluorescence, results from microbiology will be positive. No more wasted biopsies or swabs with false negative results. This of course does not eliminate the need for microbiology to identify specific bacterial species, it actually makes the whole sampling process more efficient. However, many clinicians choose not to sample because of budgetary reasons in addition to the consideration for the time it takes to get results back (i.e. 2 to 5 days, at which point the wound may have progressed to a different stage). For these clinicians, fluorescence images provide real-time, evidence based assurance of bacterial presence and distribution. This real-time information on a wound’s bacterial burden may provide insight which can influence treatment decisions at the point-of-care. These latest results show that seeing ‘red’ is a real-time representation of precisely where high levels of bacteria are present. Why would any clinician not want to know that? Raizman R. (2016) Point-of-care fluorescence imaging device guides. Proceedings of the Annual Canadian Association of Wound Care; Nov 3-6 2016, Niagara Falls, ON. DaCosta et al. (2015) Point-of-care autofluorescence imaging for real-time sampling and treatment guidance of bioburden in chronic wounds: first-in-human results. PLoS One. Mar 19;10(3). Hill R and Douglas JJ (2017). 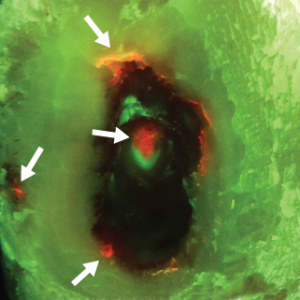 Real-time bacterial fluorescence imaging guides antimicrobial stewardship in patients with diverse wounds. Proceedings of the Annual Symposium on Advanced Wound Care (SAWC); Apr 5-9 2017; San Diego, CA.